Every three days last year, a worker lost a body part because of an accident at work. It could have been as major as a leg or just part of a finger. Such major injuries rose last year, despite government efforts to prevent them with stricter enforcement and more frequent inspections. Official figures show that the number of amputations due to workplace accidents shot up to 143 from 117 in 2015. Similarly, the number of minor injuries, such as sprains, cuts and bruises, also went up. In all, 12,948 workers were injured, a 5 per cent rise from 12,285 in 2015. These accidents could have been avoided with proper risk assessment and management, Minister of State for Manpower Sam Tan said yesterday when he released the latest figures from the Workplace Safety and Health (WSH) Institute. Hence, the WSH Council will send safety experts to 1,000 small and medium-sized enterprises (SMEs) in the next 12 months to help them identify safety lapses, under a new programme called startSafe. These SMEs will be from such sectors as wholesale and retail, food and accommodation services, and business services. They accounted for about 40 per cent of the injuries last year, said Mr Tan. He also said 60 per cent of the injured workers were from SMEs. “Everyone must adopt the mindset that we can prevent all injuries and ill health at work, and step up efforts to prevent accidents before they happen,” he said. Mr Tan was speaking at the annual bizSafe convention on heightening awareness of workplace safety. The number of workers who died of injuries at work remained at 66 from a year ago, the Ministry of Manpower (MOM) said last month. But this workplace death rate of 1.9 per 100,000 people employed is above the national target that Singapore is aiming for by next year. The target: Below 1.8 deaths per 100,000 workers. Most of last year’s deaths – 42 – took place in the first half of the year. The number fell in the second half, following the WSH Council and MOM’s efforts in impressing safety on companies and workers, and enforcing safety rules, said an MOM spokesman. The annual convention yesterday was organised by the WSH Council and MOM. It lauded newcomers to the bizSafe programme for implementing safety and health practices at the workplace. Launched 10 years ago, the programme helps companies to build capabilities in managing workplace safety and health. More than 26,000 companies have come on board, from an initial 1,900. One company cited yesterday was developer Lendlease. Its construction business and two of its retail malls bagged bizSafe partner awards. It is also rolling out the new startSafe programme at its 313@ Somerset mall, and plans to extend it to its other developments. 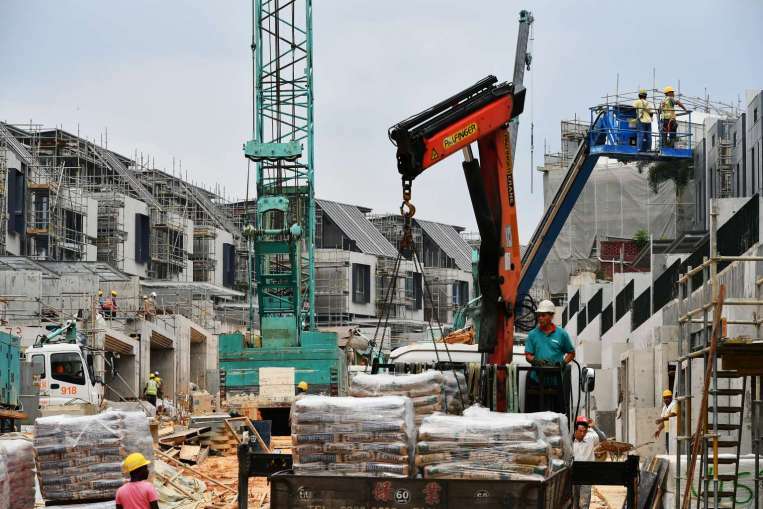 Mr Adrian Lee, Lendlease’s Asia head of environment, health and safety, said a common cause of injuries in places such as malls and construction sites is falling from height, because proper safety precautions were not taken. Mr Lee said educating workers to raise their awareness of safety risks is key.